Parking is free (courtesy of KeyBank and Independent Health) in designated Larkin Square parking lots during our public events such as Food Truck Tuesdays and KeyBank Live at Larkin Wednesdays. Parking lots are located along Exchange Street and behind the Swan Street Diner and across the street from Larkin Square. 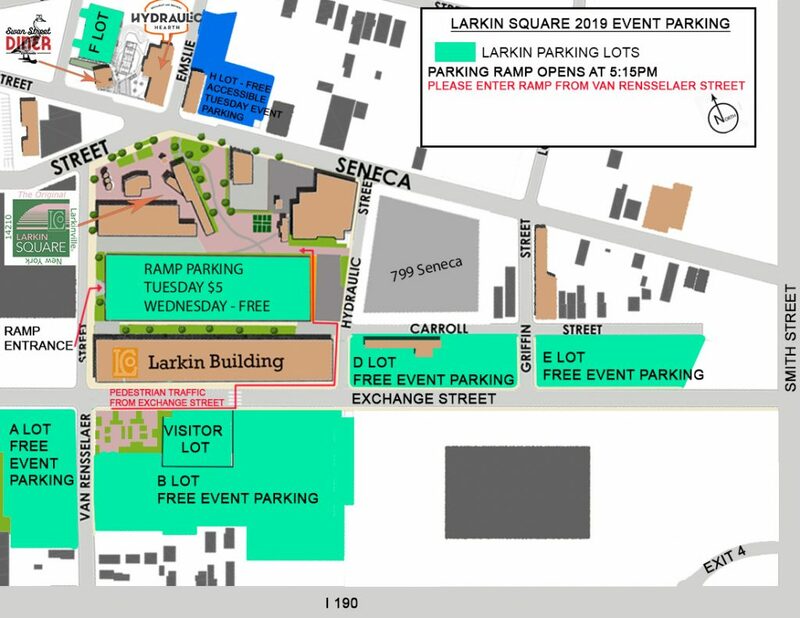 The parking ramp, located adjacent to Larkin Square will be open on Food Truck Tuesdays for a charge of $5 per car and on free during Wednesday Live at Larkin concerts. The ramp will open at 5:15 pm for these events. Enter the ramp off of Van Rensselaer Street. There is a lot located across the street from Larkin Square behind the Swan Street Diner off of Swan Street. This is convenient when attending the Larkin Square Author Series and/or dining at the Filling Station, The Swan Street Diner or the Hydraulic Hearth. Handicap parking is available in a dedicated lot (on Food Truck Tuesdays) at Seneca and Emslie Sts. Enter the lot off Emslie St.
Larkin Square is centrally located near downtown Buffalo at 745 Seneca Street, or the intersection of Seneca, Swan and Van Rensselaer Streets. It is one mile southeast of the First Niagara Center, and just off the Smith Street and Hamburg Street exits of I-190. Larkin Square makes for a fun biking destination. Specially designed bike racks are located at the entrances to Larkin Square on Seneca Street and on Swan Street by Hydraulic Hearth.